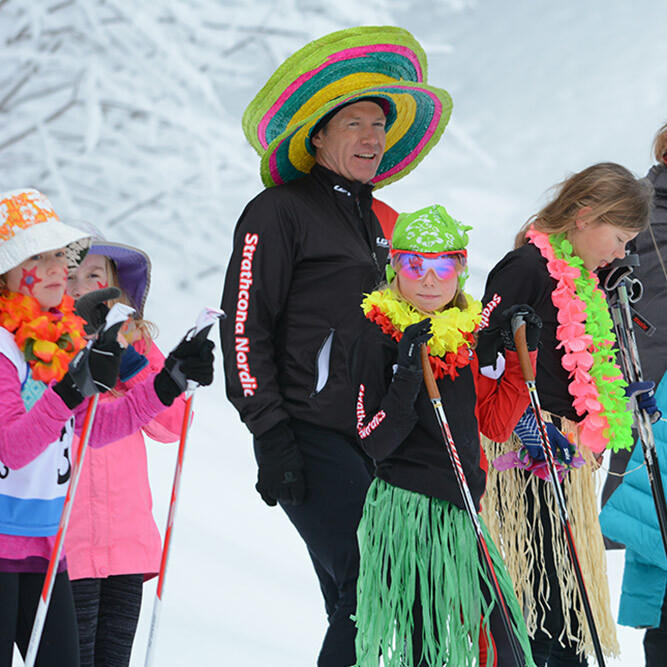 Strathcona Nordic Ski Club has a program for everyone! There are recreational and racing programs for adults and children and also coach and race official training opportunities too. The Kal Tire Bunny Rabbit, for children 4-5, and Jack Rabbit programs, for children 6-8, are part of the Skill Development Program (SDP) from Cross Country Canada and Sport Canada’s Long-Term Athlete Development Model (LTAD). They are designed to encourage lifelong participation in cross-country skiing while developing all participants to their full potential. The Youth Learn to Ski is a fun, beginner recreational program for children ages 10-14 years, with little to no skiing experience, who wish to learn or improve their classic and skating techniques in a fun, social group environment through a season of coached sessions. The Strathcona Nordic Adventure Program (SNAP) is for children 10-15 years. It brings together a number of disciplines in the family of Nordic skiing sports. SNAP continues to build on existing classic and skate skills, introduce and/or expand on snowshoeing skills, one of the fastest growing winter sports, and give kids an opportunity to try out the exhilarating sport of biathlon which involves both skiing and rifle marksmanship as well as ski-orienteering which includes map navigation along snow trails and tracks. Devos is a group of keen 8-13 year-old skiers who work hard and have FUN! Designed to promote the continued development of physical literacy and fitness, the Devo (Track Attack) program is the next step, after Jack Rabbits, in Sport Canada's – Long Term Athlete Development (LTAD) model; skiers in this group are at the Learn to Train stage of development. Enhancing competence in the basic skills required to excel in cross country skiing, personal challenge and having FUN are the aims of this program. The Junior Racing program guides dedicated youth toward the pursuit of excellence in Nordic sport. It follows the Sport Canada – Long Term Athlete Development (LTAD) model; athletes are at the “Training to Train and Learning to Compete” stages of development. The aim of the program is personal challenge where competition is seen as a process through which athletes learn to be prepared, participate with intention, be supportive of teammates, do their very best, and reflect on what has been learned. These programs are for recreational skiers: novice, intermediate and advanced, who want to improve their skiing technique (classic and skating) and fitness – in a fun, social, and group environment – through a season of 8 coached sessions. This program is for Masters (19 yrs +) athletes who are interested in skiing for fitness and competition - but have other life priorities such as school, work, and/or family. Masters Racers enjoy a season of coached on-snow sessions from December to March, and dry-land training opportunities from May to November.